After attempting the SkyWalk at 194 metres above ground, the next challenge we took on was the Auckland Harbor Bridge Climb (highest point is just 43.27 m above high water). This is a 1.5-hour guided tour of the Auckland Bridge where we got to climb under, around, up and over the bridge – at times we can even hear vehicles zooming past on the roads just a few metres above our road. As this tour brought us to the highest point of the bridge on top of Auckland’s busiest passageways, it will be very dangerous to drop things right down to the road and vehicles – thus we are again suited up in jumpsuits with specific instructions not to bring up any cameras and loose items. Lockers (no charge) are available for you to store your valuables and bags. 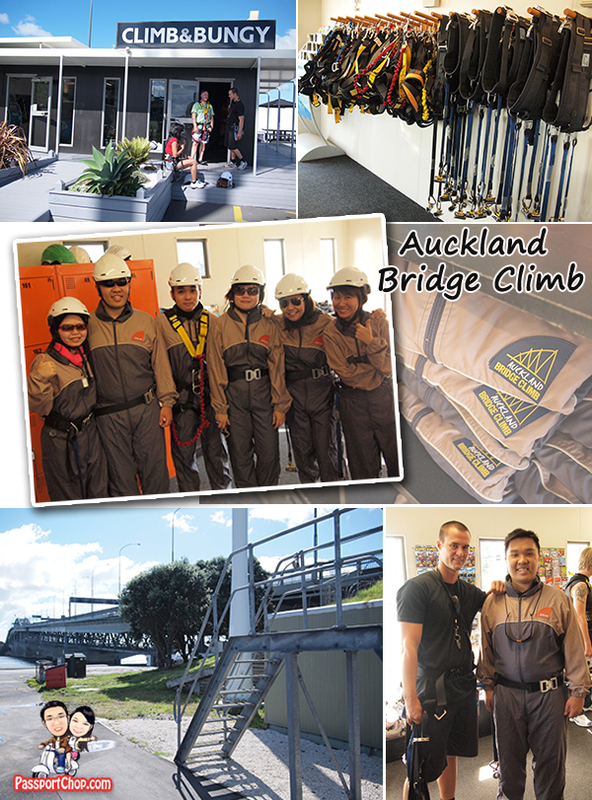 Our main safety equipment was the strap that could be easily hooked on/off the guiderail along the bridge’s walkways – we even got to practise on a mini bridge just outside the Auckland Bridge Climb & Bungy Base. The walkways under and above the bridge are custom engineered to provide a safe, enjoyable and easy-going experience; there weren’t a lot of stairs but there were parts where the clearance above your head could get quite low (this is where your helmet would come in handy) and steep slopes. Be prepared for lots of walking throughout this 1.5-hour tour and the guide provided extensive commentary on the history of the bridge and interesting facts about parts of the bridge e.g. the bridge started off as a 4-lane road but had to be expanded to 8 lanes to cope with increasing demand. What they did was engage a Japanese engineers to design 2-lane bridges which clipped on to each side of the original Auckland Harbor Bridge and these were known as “Nippon Clip-ons“. 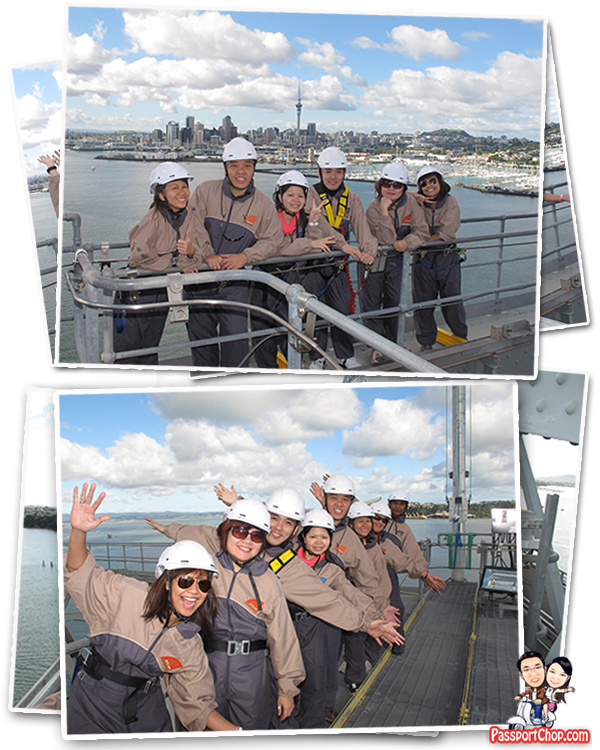 The best part of the Bridge Climb had to be when we were all at the bridge summit – here we got a 360 degree view of the Westhaven marina, Sky Tower and the Auckland CBD skyline. Your Bridge Climb guide will take a variety of photos of you and the group at the summit with the spectacular Auckland backdrop. These will be available for purchase when you get back to Base. These photos are packaged into a unique Auckland Bridge Climb album available for purchase at NZD$80. 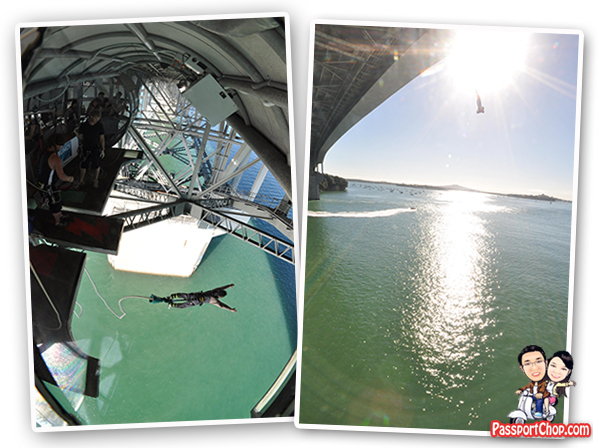 If you feel that just walking the Auckland Bridge is not challenging, take on the Auckland Bridge Bungy instead! This is the New Zealand’s only ocean touch bungy where you could barely just touch the surface of the sea or even dunked as you reached the tail end of your bungy. This experience comes with an authentic Bungy Jumper t-shirt and Jump Certificate for you to show off to your friends back home that you took the 40m leap down Auckland Bridge. Not feeling too adventurous? Your Bridge Climb Guide could arrange for you to check out the jumps from a safe vantage point on the bridge – hear the shouts and splashes and check out their horrified faces as they jump off the specially constructed Bungy pod just below the bridge. Adult Prices for Auckland Bridge Climb and Auckland Bridge Bungy are NZD$120 and NZD$150 respectively (as of 9 April 2011). There are discounts for Students/backpackers with valid ID and Family packages (2 Adults and 2 Children). Check out Auckland Bridge Climb website and Auckland Bridge Bungy website for more information on opening hours and prices. Transportation to Auckland Bridge Climb & Bungy is available from the Maritime Museum, located in the Viaduct. Trips depart daily at 9am, 10.30am, 11.30am, 1.30pm and 2.30pm. Call +64 9 360 7748 to book. AJ Hackett Bungy New Zealand which runs the Auckland Bridge Climb and Bungy also runs various bungy sites around New Zealand – if you want to try it all or just both Bridge Climb and Bungy, combo packages are available at this site: http://www.bungy.co.nz/activities/hot-deals-combos. You can even try all 4 Bungy Jumps + 2 Swings + 1 Bridge Climb in New Zealand at just $725 (Total value of $1200). I read the blog. the blog attracts me very much and helps me. It is useful for tour lovers.Thanks the author and blog writter. This is absolutely amazing! I have never been to New Zealand but desperately want to go! Now I know what I’ll be doing there! I love climbing things, and although I’ve never been bungee jumping, I’ll try anything once! Thanks for the great tip! Amazing it’s a stunning work done by this group. I really thrilled to watch it. Auckland Harbor Bridge is situated in New Zealand is very interesting place to visit. If I’ll get a chance in near future I’ll surely visit this place. There are certainly lots of particulars like that to take into consideration. That is a nice level to carry up. I provide the ideas above as normal inspiration but clearly there are questions like the one you carry up the place the most important factor will probably be working in honest good faith. I don?t know if best practices have emerged around issues like that, but I am certain that your job is clearly identified as a good game. Both girls and boys feel the impression of only a second’s pleasure, for the remainder of their lives. Nice informational post! I’m on a tour and your blog is a great help for those who are following a New Zealand trip. Hello! I simply wish to make a large thumbs upward for that terrific guidance you’ve here on this post. I will be returning to your site for additional shortly. Nice place to see. And Auckland Harbor Bridge is the one of the finest places in New Zealand.